Since Quinn’s was the last of the yearbook panels, I’ll post all the entries I created for them. Since I planned for them to be skewed, I knew I’d have to do some overflow artwork. It’s hard to tell how much you’ll really need in these cases, so it’s best to make more than enough. The last thing I wanted to make those work, was to leave them simply flat. In which case, they don’t work. I couldn’t have them look like panels within panels. Haha, yet again, the facial expressions alone leave me laughing ’till my sides are sore! How long does it take you to come up something that you find sufficiently funny? Or rather, how long does it take you to DRAW something that’s funny enough? Can you do it on your first sketch? Also, I couldn’t help but notice that Ellie and Quinn have similar color patterns that they did at the beginning of the series. Ellie still has white and blue, and Quinn has purple and black. I guess their change of clothes after their fight was more than a functional change- it was a symbolic one as well. then obviously going back over the lines, setting the flat colors, adding gradients to each flat color, then adding the shadings for each new gradient’ed color segment. Then I color all the interior lines. Then replace the word balloons. Then I hate the whole thing and start on the next strip. :D well, it’s a good thing you aren’t doing this on MS paint anymore, is it? That would be brutal. Wait, did you really used to use ms paint to make the comic?! O.O That’s insane! What program do you use now? I knew it had to take a lot of work to put a web comic together, but I never realized you had to go through all those steps! I did use paint, yeah. Every now and then I still will (depressingly.) I’m still living in 1997 now with my Photoshop 7. I actually have Photoshop CS-whatever, but I’m just too used to the old version. I never could figure out Photoshop CS, I actually have Photoshop 8 but all I’ve been able to do is figure out how to change colors on pictures lol. How do you make sure the old versions of Photoshop still run on newer computers? I have a version of CS that I bought when I was a student, and am terrified of losing it whenever I get a new computer. The first panel made me LOL, and is that Ellies manager on the right? Holy Cow, that would also explain why she didn’t get fired her first day. Unrequited puppy luv. I looked back at a comic with him in it (desperation) and saw that he had more orange colored hair. Plus, he appears to be several years older than Ellie, so I’m not sure that’s actuall Barrel on the right. 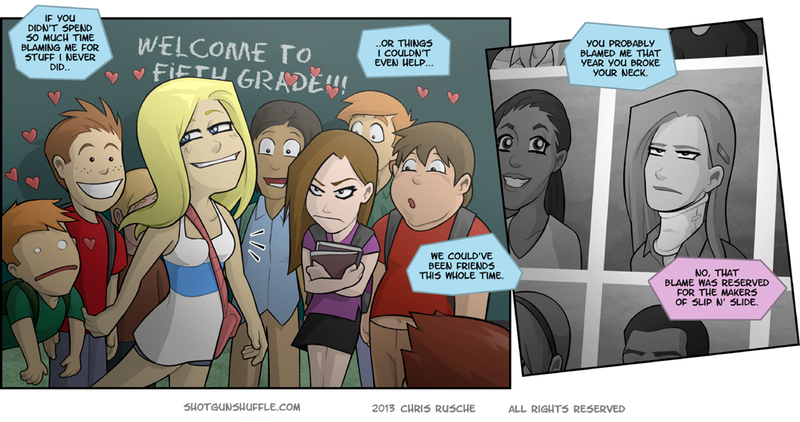 Heh, that leftmost kid. He’s either floating, or about to face-plant. I DON”T WANNA KNOW. Bad enough memories with a car accident and trauma associated with. Slip-n-Slides are the work of the devil. Your points are valid. Also, don’t put it on a hill and add glycerin (the kind you add to JOY dish soap to make monster bubbles), there are similar results. Never used one, but I thought the suggestion to check for rocks before putting one down from a Dane Cook sketch also sounded like good advice. Mine was always on a flat surface, devoid of rocks, sticks, and other “bumps” that could spell massive pain. The irony, was I was standing still, applying more dish soap, because I didn’t think it was slippery enough… and then “VWOOOOP!” backflip. I don’t even know how it happened… I just remember finding myself on my back, with the air knocked out of me, and my brother and our friend laughing. Sorry, I snorted at that. It’s alright. If I’d been seriously hurt, I might be offended, but looking back on it, and “the look I had on my face”, it must have been highly amusing to watch. I suppose that you’re thankful that phone cameras were not attached at the hip. Looking at Ellie’s twin again, I am getting the impression that she may be somewhat like Quinn, and that one of the reasons Ellie acts so familiar with Quinn is simply she reminds her of her sister. In the school photo, her expression in like Quinn’s with a side of skepticism. 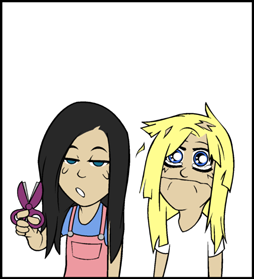 Bahahahahah the expressions throughout this whole week’s strip are killing me. Especially the one of the farthest left and Quinn, with her broken neck! She looks so defeatedly miffed. hahaha!!!! Jinkies man, make her sound like Stalin already. This is serious business! We can’t simply wait for this madwoman to take over the world! We must act NOW! Okay, do you think that she has any connection to Syria? If you don’t think there’s any connection between the two… you’d be mistaken. Ellie seems to remember more and more about Quinn the longer their conversation goes on. Kinda funny how she remembers all this about Quinn, but couldn’t remember her name. But then again, I guess a lot of people can be that way. I remember strange folks I knew in highschool and the weird stuff they may do, but not remember their names. Hrm… Guess that ISN’T weird like I thought it was. Forgive me for my mawkishness, but I think I’m realizing a bit more about myself the more I read this comic. It’s been a learning experience in more ways than one. I remember at graduation I knew a lot of people that were up on stage, their nick name and at least one story about them. Not sure how many knew my name, or much about me though. College time came and I tried to change that. Not so much by being some loud party guy, but just by getting to know more people and always being a friend when I could. Seemed to have worked, cause I’m told I got a lot of cheers when I went across the stage. I wouldn’t know. As as soon as I stepped up on that stage, in front of that stadium of people, it was all a blur until I was on the other side. Felt like I blacked out but apparently I made it across and managed to strike a pose after getting my diploma. I remember my cousin stopped on stage a step away from whomever was handing them out and opened it up to verify the diploma was really in there, did a small fake relieved nod to himself and continued walking.